Here is a design for the Villain of my "Make Believes" story (see first post). 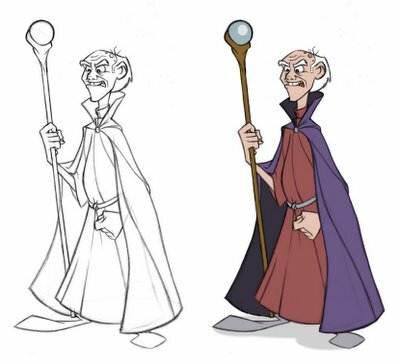 He is an old wizard-dude who steals the imaginations of children to become young again. Pretty standard really. I just love the way the cape is slightly longer than his "dress";). Really nice stuff Ben. I love the feet, they add just the righ amount of contrast. You know he got all the ladies back in the day. You go old man! :) Great drawing as always. I thought I would tag you. Read this link and then cut and paste your answers on your blog. Of course you don't have to do it if you don't want... I think it is a cool way to see others and find out a little more about fellow artist. Thanks about your message Ben!! I really like your stuff!!! Great blog you got here, congrats on landin a gig in Florida! I recognize some of the names on your links..did you go to school in Toronto, or Ottawa?..actually, come to think of it,did you even go to school in Canada? NICE man, great shapes and color work too. Can I come work with you guys...pleeeeeze.